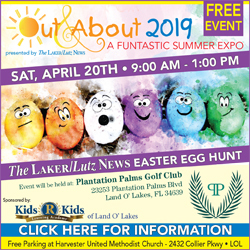 Kimberly Wilson found out about the All Pro Dad program after sifting through a few children’s books a parent had recently donated to the Lutz Learning Center. That parent was legendary NFL coach and Hall of Famer Tony Dungy. Tony Dungy, left, has a chat with John Viscardo, one of the dads in attendance. After speaking with Dungy and finding out more about the Family First-based fatherhood program, Wilson, the learning center’s director of innovation, was “ecstatic” about creating a chapter at the independent private school, which currently serves 120 students. 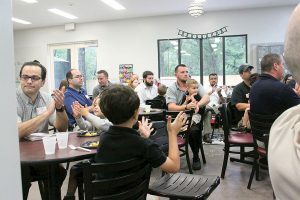 That’s what happened at the first chapter meeting on May 18, when 15 dads bonded and shared a meal with their young ones at the Lutz Learning Center campus. Fifteen fathers attended the Lutz Learning Center’s first All-Pro Dad Chapter meeting on May 18. The program uses football themes to tout the importance of being a good father. The overall goal of the discussion was to empower children to “complete what they start” and “do their best” in all aspects of life. 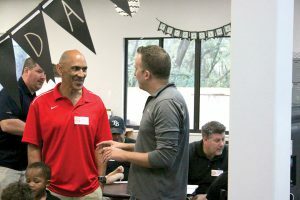 The topic of “Finishing Well” also provided an opportunity for Dungy to reflect on one of his coaching experiences from nearly a decade ago, when he was the head coach of the Indianapolis Colts. It was the 2007 AFC Championship game, where Dungy’s team faced the New England Patriots, and quickly fell behind 21-3. They eventually mounted a historic comeback to capture the Super Bowl XLI title, with a score of 38-34. “Everything went wrong early in the game…and it would have been easy to give up and say, ‘Oh well.’ But we didn’t,” Dungy said. “Our guys continued to play hard and work hard…and encourage each other. “If you continue to encourage even when things aren’t going well and do your best, things usually work out,” Dungy said. Throughout the early morning session, the private school’s dads underwent positive affirmation activities hoping to ensure their young children know that their fathers support them. 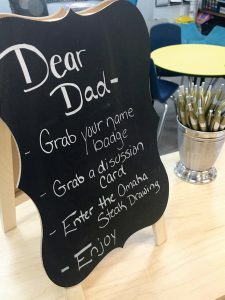 This sign tells dads what they need to do at the All Pro Dad meeting. Part of the morning involved a human knot disentanglement puzzle exercise, that required teamwork, patience and perseverance, from both the dads and the learning center’s students. 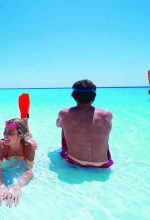 It turned out to be an “awesome” experience for one dad in attendance. All-Pro Dad was launched in 1997 by Mark Merrill, with Dungy’s help. The goal of the program is to use football themes to speak out on the importance of being a good father, the program’s website says. The program has spread to 1,293 schools across 46 states.